Introduction: Anglers often see affordably priced Pinnacle combos in retail store racks, but did you know the company is also a major OEM (Original Equipment Manufacturer) of many other branded reels? Chances are you might even own a Pinnacle/Silstar reel if you frequently buy from one of the major catalog/e-tailers. Pinnacle has proven that they can build a quality reel at a reasonable price for others, but we have always hoped to see more from the company's own branded offerings. For 2007 the company answers the call with a complete lineup of new baitcasting reels that sport the "Pinnacle" brand. Pro Select: The Pro Select 10 rests at the top of the new Pinnacle lineup and features 8 stainless steel bearings, metal construction, an unlimited anti-reverse, a titanium shielded line guide, audible click star drag, and multi-stack Trulon drag system. 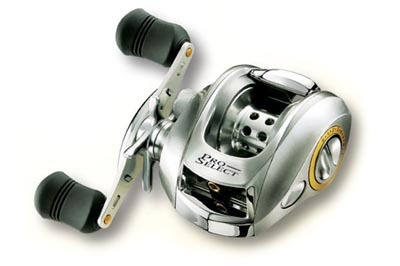 Cast controls are tandem, and like the system found in many Pflueger reels, it is both magnetic and centrifugal. The TCC (Tandem Cast Control) makes use to the centrifugal system at the beginning of the cast and the magnetic system throughout the cast. The MSRP for the PSE10 is $139.99. Many anglers are not used to seeing a Pinnacle reel at this price point, and as of right now it is quite difficult to find this reel on the market. 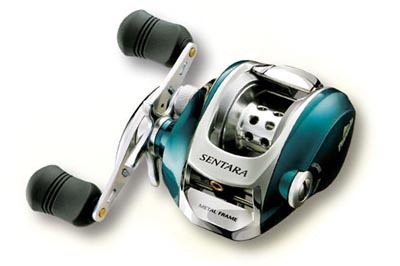 Sentara: The Sentara features the same metal frame and metal gear box, and we love the color of the reel, but the external cast control system found on the Pro Select is absent from the reel. Instead the Sentara features a "Easy Dial" Centrifugal brake system that reminds us of Daiwa's Centreflex design. The reel is a tad bit lighter than the Pro Select due to the simpler cast control system. It features the same titanium shielded line guide, audible click star drag, and multi stack Trulon drag washers. The Sentara retails for 20 dollars less than the Pro Select for $119.99. Extant: The Extant makes use of the same sleek ergonomic metal frame as its two aforementioned siblings and has all the same basic features as the Sentara but with a major bearing drop down to 3BB + 1RB. It is only 15 dollars less in price ($104.99), which makes us wonder if there really is a market for this particular reel. 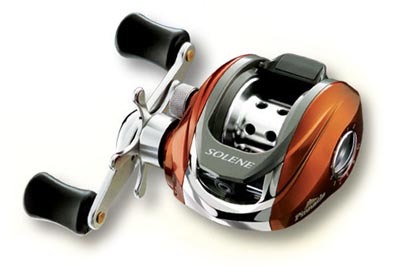 For such a minimal price delta we would opt for the Sentara or move to the next reel in the Pinnacle lineup...the Super 7, which is in some ways a superior reel to the Extant. Super 7: The Super 7 weighs in at a light 7.9oz, and the main reason for the large weight difference between the Extant and the Super 7 is that the Super 7 features a graphite frame. 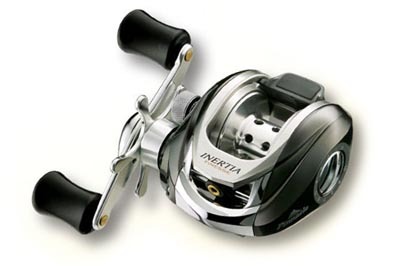 The Super 7 features an externally adjustable cast control system, unlimited anti reverse, titanium shielded line guide, and an audible click star drag. Interestingly the Super 7 features a much higher bearing count than the more expensive Extant, ....you guessed it, 7 bearings total. The Super 7 has a MSRP of $74.99, but can be found on Cabelas for only $54.99. Inertia: The Inertia is a brand new reel that is positioned at the same level as the Super 7. It features the same frame and magnetic cast control system and gets a slight bump in bearing count. 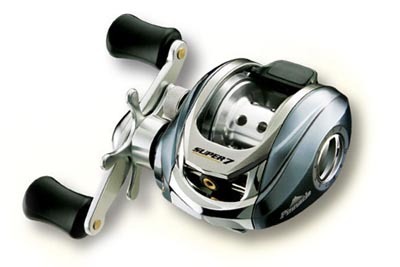 The reel retails for $79.99, the exact same price as the Super 7. It isn't slated as a replacement for the Super 7, but it certainly equates to a slightly up-spec Super 7. Given the choice most anglers would opt for the Inertia even though it weighs just a tad more than the Super 7. Unfortunately the Inertia is seemingly impossible to find at this particular time. Solene: The brightly colored Solene has the exact same features as its siblings but with a 5BB + 1RB setup. All of these bearings are stainless steel. The Solene's MSRP is only $59.99. Just when you thought this was the last possible specification with the same body Pinnacle tosses in the Platinum Plus for mainstream anglers. 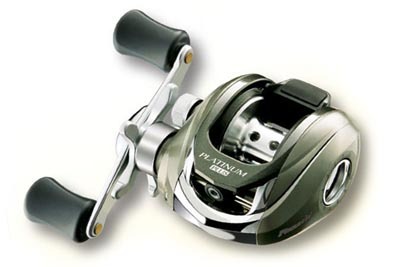 Platinum Plus: Designed for the mainstream angler the Platinum Plus features the same gear ratio as all of its siblings and has the same graphite reinforced construction of the Solene. So what makes this reel any different? How about one less bearing and a 5 dollar price delta. The Platinum Plus retails for only $54.99. You may be asking yourself....why? Why are there so many reels in the Pinnacle lineup with so little difference? The answer rests in Pinnacle's OEM experience. To truly cater to the needs of their clients they have to produce reels in every single class and price point, so that once a retailer knows what application and price point they are looking to fill Pinnacle can respond with a solution. Conclusion: It is nice that Pinnacle has so many new reels but at the same time we wonder if there is enough differentiation between all these various reels to actually warrant so many models. Perhaps this is one of the reason why so many of these reels cannot be found on e-tail sites, they are simply just too similar. If you notice every single one of these new reels sported the exact same gear ratio. We know that Pinnacle can build high speed reels, they do so for the major catalogs. Because of the similarity of these reels if an e-tail store just picks one of the metal construction reels and one of the graphite variants they pretty much can cover the entire spectrum of applications for those anglers willing to give Pinnacle a try. This is in fact what the major catalog/e-tailers are doing, either with a re-badged Pinnacle creation, or a branded Pinnacle reel. That said we are happy to see that Pinnacle is indeed putting more emphasis on both the technology behind their products and their own branded offering. While it may be difficult to compete with their own OEM reels they produce for others, we certainly hope to see more Pinnacle branded reels in the future. Success for their branded solutions rests in better distribution of their products, as well as increased differentiation between their branded and OEM product.